The weekend always looked likely to be a good one as far as the autumn migration and interesting visitors were concerned. The recent gales - the aftermath of Hurricane Katia - hammered the western coastlines of Britain, and as a consequence brought with it some expected and unexpected guests. The Scilly Isles were the place to be, with umpteen birds I'd love to see. One of these was a striking black and white-coloured American warbler known as... a Black-and-White Warbler! For something that looks so exotic, you'd think someone could have thought up a better name for it. No matter, because I'm in no position to visit the islands - a trip for another day I can currently only dream about. While the megas have been crowding the far west, there have been plenty of other scarcities and rarities to keep even the most experienced and hard-nosed of birders happy. Two species that have been showing up all over the southern coastline as well as inland have been the Sabine's Gull and the Grey Phalarope. 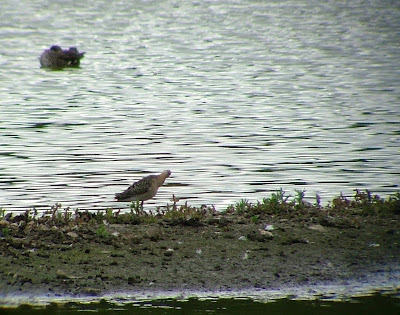 The latter has appeared twice in the Surrey area, with one discovered by Shaun Peters at Frensham Great Pond on Thursday evening. Johnny Allan managed to get to see it before the sun went down, but I drew a big, fat blank the next morning. Both Bob Warden and I scoured the Pond and couldn't find it. It must have flown off during the night. Disappointing, but not much of a surprise. It could have been there for a while but no-one had noticed it in amongst the reed beds. It's only a small bird, so it could easily have been overlooked. A mixture of house jobs and visiting friends meant I was out of birding action all weekend - frustrating seeing as so much was happening all over Britain. Then I received a text from JA. 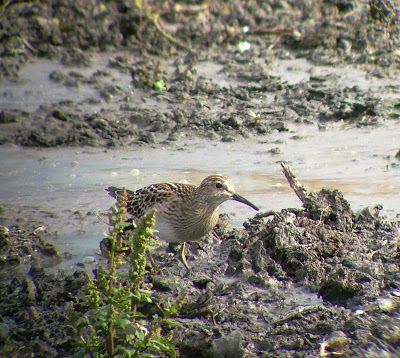 A Pectoral Sandpiper had dropped in on the main lake at Beddington. 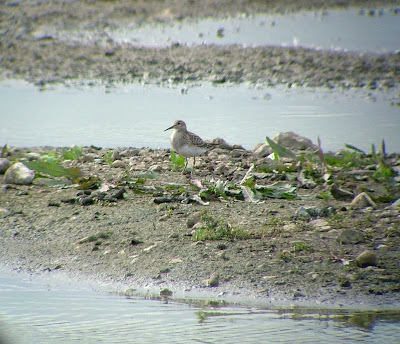 Beddington is probably the best site in Surrey for Pec Sands. These American waders can't resist the rich pickings on the scrapes and sludge beds around the Farm. One showy individual appeared for a few days last year - loads of birders came to see it - but I infamously managed to dip it on two occasions, once when walking round with Johnny for two hours, and the second time for another two hours with Kevin 'Kojak' Eason - the latter occasion the bird had probably just flown off just before I had got there. For that reason I knew Johnny was anxious for me to get to Beddington to see this bird - but I had to wait at least another 24 hours before I could get there. Work yesterday meant I couldn't travel over until the afternoon. 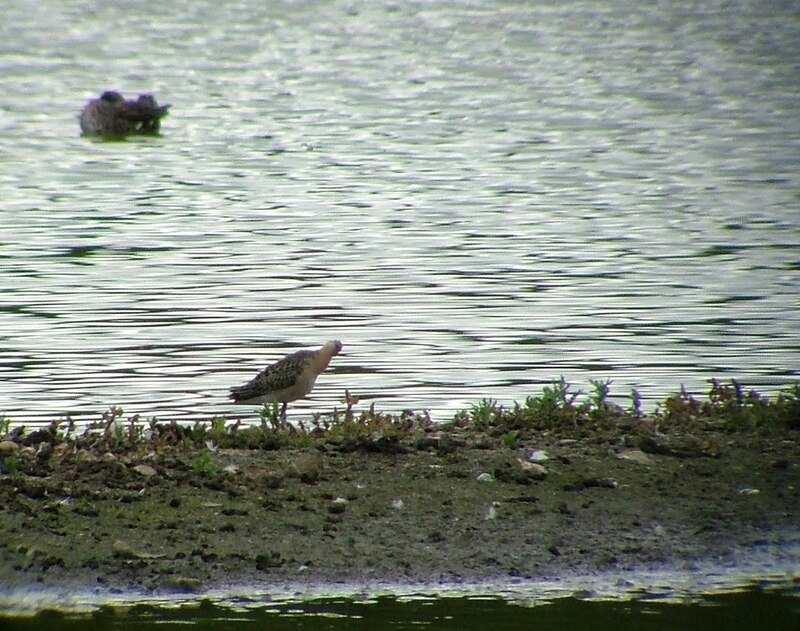 The bird had moved to the northern end of the farm on 100-Acre lake. I arrive just after 2pm. As I walked along the path adjacent to the perimeter fence I bumped into a group of birders. "Are you Neil?" they asked. Yes, that's me, I said. "Johnny's waiting for you at the top of the path." Blimey, word gets round. Five minutes later I met another birder walking back down the path. "Are you Neil?" he asked. Yep, it's me alright, I replied. "Johnny's unlocked the gate for you. Shut it behind you and you'll see where to go." It was if the local birding community had joined together as one and were going to lead me to the Pec. All it needed were a few signposts dotted around with arrows telling me where to go! I appreciated it though. Johnny is a good bloke, always keen for people to enjoy views of birds at his patch. Eventually, I was in place. 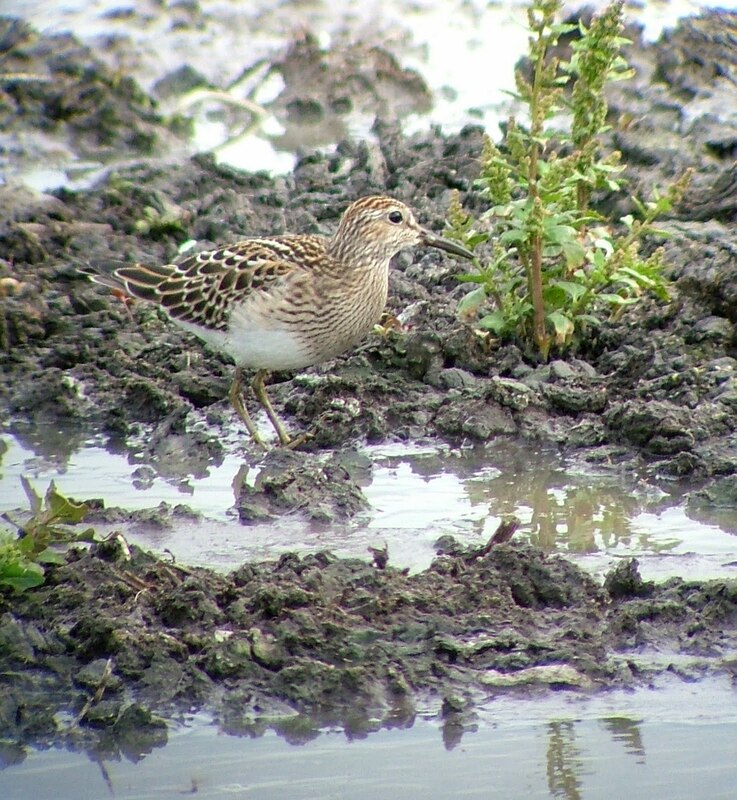 Johnny pointed to the juvenile Pectoral Sandpiper (160) on a small island on 100-Acre lake. At last! The view from the path was slightly obscured by nettles, so I move round to the end of the lake for a better view. Great stuff. 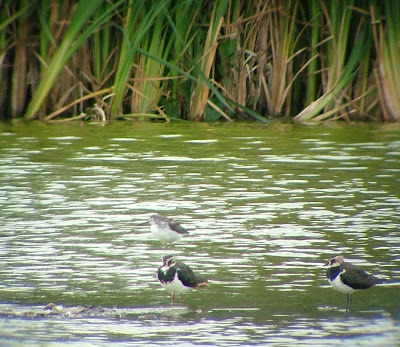 it was a really neat little wader. Johnny wandered off to the gate waiting for a few more visitors. 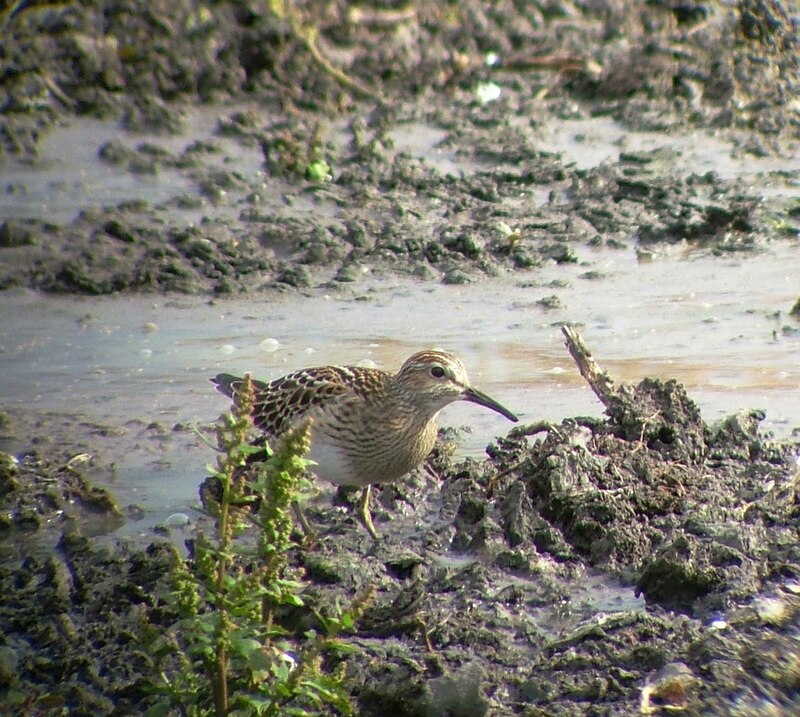 As he did so the Pectoral Sandpiper took flight. It didn't go far, just dropping down onto a sludge bed on the other side of the path. We both looked for it but couldn't see anything. Then Johnny spotted it. It was right under our noses, less than ten yards away, feeding happily. And there it stayed for the next 45 minutes. It was more concerned looking up at the skies for roaming predators such as Sparrowhawks than humans. More people arrived and we all had fantastic views of this American migrant, that should have been heading towards South America, but had been blown 3,000 miles off course to Beddington. Makes you wonder what will happen to the little fella? There's no way he will be heading back the way he came, that's for sure. 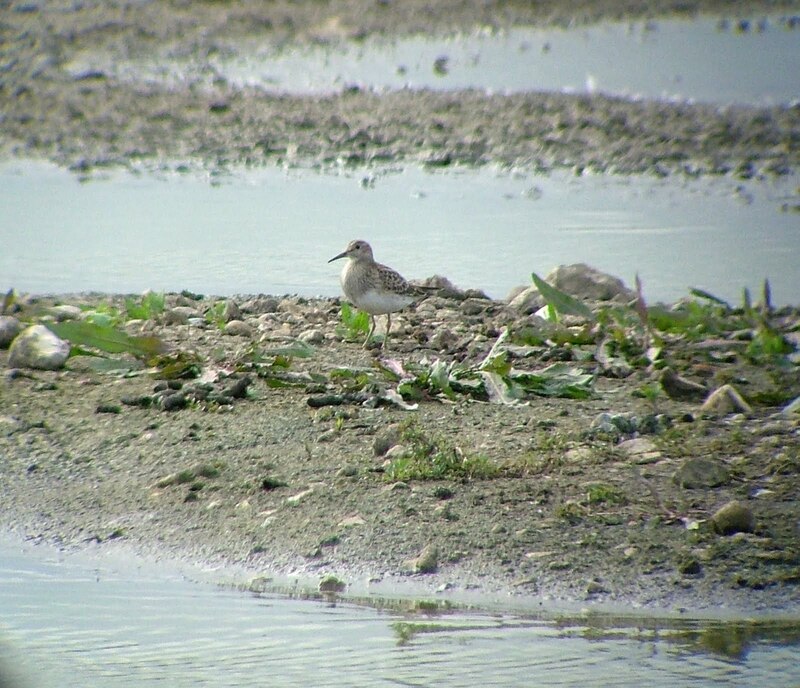 Derek Coleman took over as host of the group, and we went over to have a look on 100-Acre at a Ruff (161). 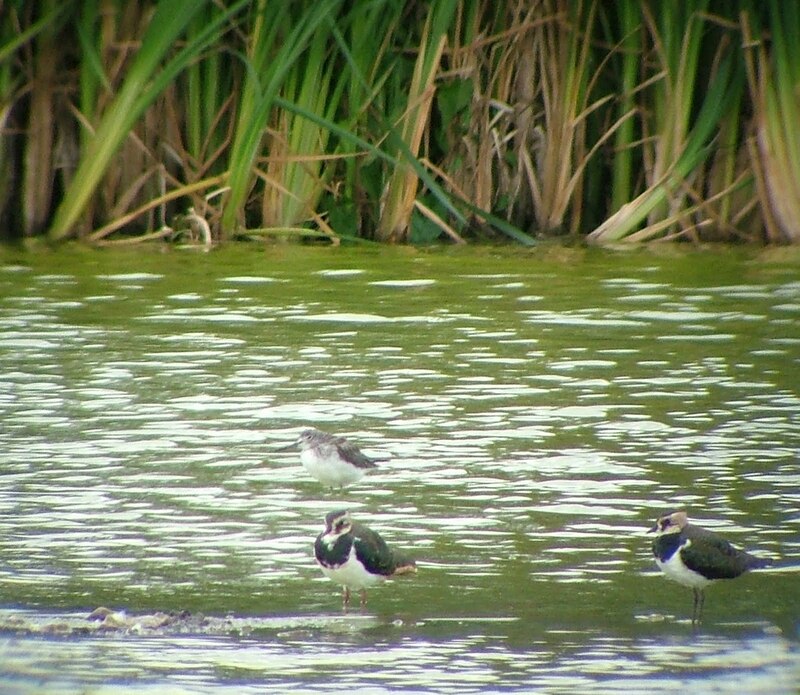 It was with a group of Lapwings, three Snipe and a sleeping Greenshank. It was a very nervous bird and took to the air frequently, hence the rubbish record photo. So ended a top afternoon. 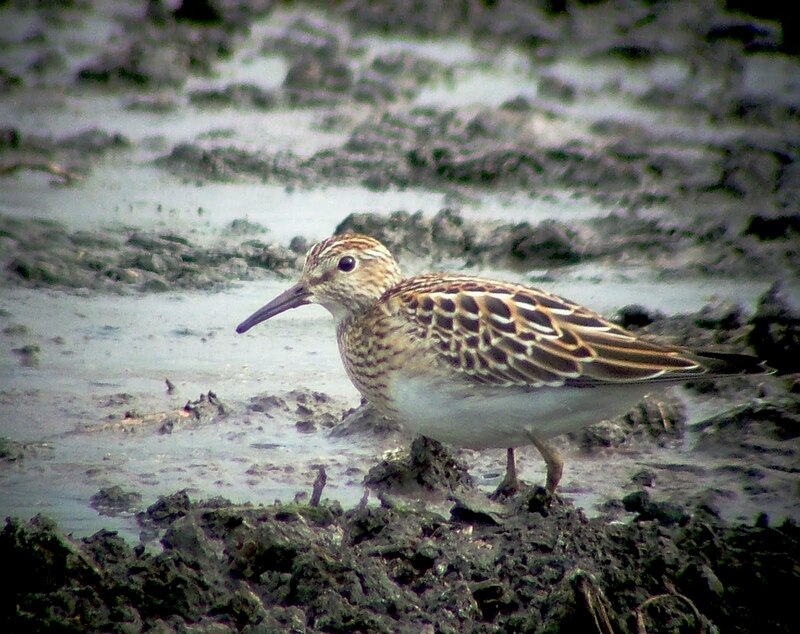 Many thanks to JA for his persistence and eventual success in steering me inexorably towards the Pectoral Sandpiper after a year's pain! Your Surrey list is approaching my UK total ! I admire your determination at seeing these birds,I find birding in the UK hard (but enjoyable)work. I must need new glasses or something because Gordon Hay saw at least 10 more species than I saw at Holmethorpe on Saturday afternoon !! ps really enjoy your blog.